Sleeping in Airports – My Experiences and Some Tips! So, not every photo we take can be a winner or, to be fair, even remotely worth looking at. Sometimes, though, when we’re going through the results of our shoot, we come across a photo that is technically horrible, but we fall in love with the subject or composition anyway. Maybe the photo was underexposed, overexposed, blurry. If we’re lucky, we can save it. It will never win any awards, but we might be able to make it at least view-able. Today I’ll show you how I saved one such image with photo editing tips to save underexposures. Shooting performances, like Broken Leg Theatre, has a lot of challenges. Backstage photos even more. Backstage at any show is dark, even during rehearsals. That makes shots taken in the wings difficult, or even impossible. Flash is no good because that could leak through the curtains and the audience might see it, not to mention you’ll blind your performer! You could use a tripod but that brings it’s own problems. There’s not usually a lot of space back there, so you’ll be even more in the way than usual; you’re probably moving around a lot taking pictures of the performances so your camera isn’t even on your tripod and by the time that’s all set up, the moment you wanted to capture is gone… and you’ve missed a lot of other moments in the meantime. This is the dilemma I faced during rehearsals at my first Broken Leg shoot. 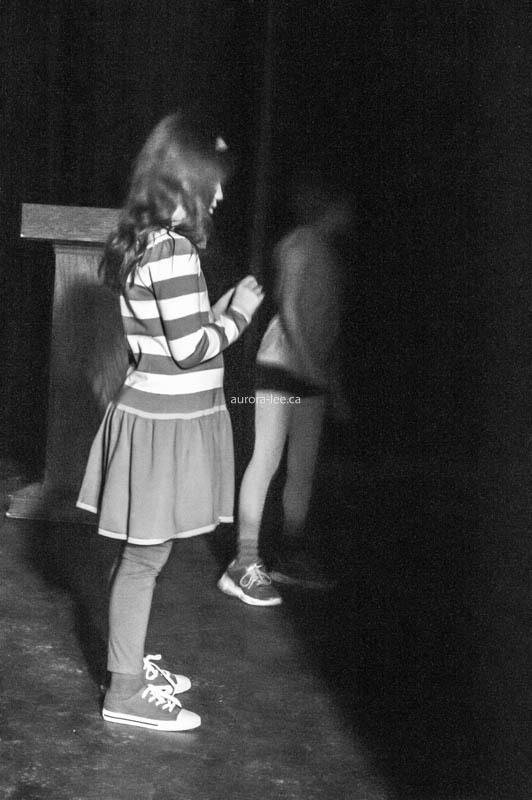 As I stood in the wings getting some side shots of the performers on stage, I turned around and saw this girl waiting for her turn. She looked nervous, or maybe bored. I thought it looked like a great shot. I shrugged, fiddled with a few settings to allow in as much light as possible while shooting handheld (i.e. it wouldn’t be horribly blurry), and fired off a shot. Hoping I had something to work with, I went back to what I was doing before. The resulting photo was… not good. The colours in her cute outfit are dull and everything is underexposed, and not in a fun, artistic way. Note that some of these options might not be available to you if you’re not working with a RAW image. Image was at 1/4 sec. (about as slow as I can shoot handheld when I’ve got nothing to brace myself against), f5.6 (the lowest aperture on my lens), ISO 3200. I figured the photo was useless. The composition itself wasn’t even that great. There was just something about that girl that made me want to play around with it and see if there was any way I could get something decent out of it. I used the Develop Mode of Lightroom 5 for all steps in this process. Everything is under the ‘Basic’ heading unless noted. Don’t worry about the numbers I used too much. Things will depend on the particular photo you’re working on. Play with the sliders to see how things work for you. Step 1: increase clarity. Because Aurora always increases clarity! I tried to not be so heavy-handed here, but you’ll see that further along the timeline, I just went for it and put it at 100. So go ahead and do that, and I’ll skip that step below. Step 2: Time to see if there’s even anything to save here. Increase the exposure. I when to about +3.5. Well, there is something there. Everything I liked about the scene when I took it is definitely there, but… man… it’s still not good. I had nothing better to do, so I kept going anyway. Step 3: Noise reduction. Between the high ISO I had to use, and increasing the exposure so much after the fact, the photo was really noisy. Toggle on the the “Detail” heading. Here, I increased Luminance to reduce those noisy artifacts to a more acceptable level. Unfortunately, that made the image too soft. There would be no happy medium in this image. Step 4: When in doubt, try black and white. I usually convert to black and white by decreasing Saturation to -100, although it’s not the recommended method. I liked the result. Between the softness caused by the Noise Reduction, and the blurriness from shooting handheld, the photo didn’t just look like a black and white image, but an old timey black and white image. Steps 5-7: After going all out on clarity, like I mentioned in Step 1, I probably could have stopped. Instead I did tweak a couple more things just to bring out a few last details. I tweaked contrast and white clipping. Obviously, the goal is always to get these things right when we actually take the photo. It’s nice to know we have options, though, when circumstances mean that can’t happen.